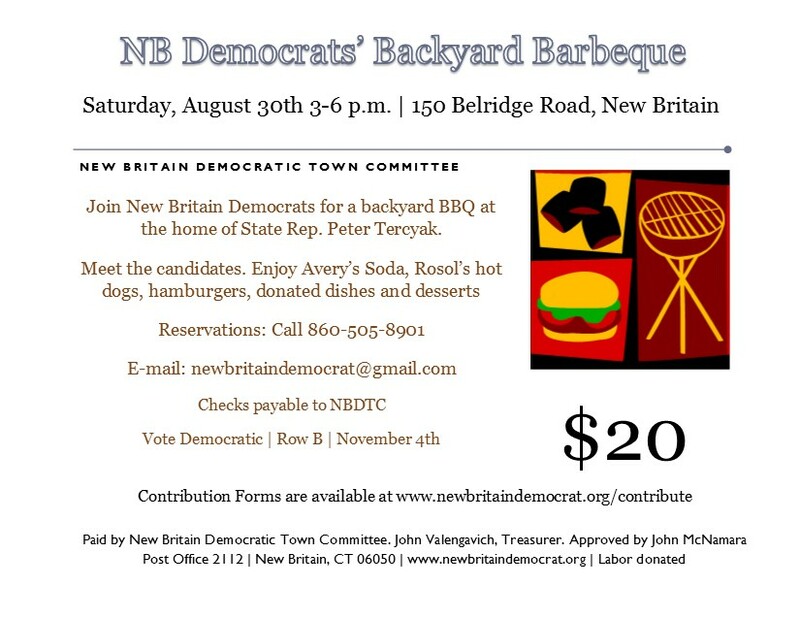 Join New Britain Democrats Saturday, August 30th, 3-6 pm for a backyard BBQ at the home of State Representative Peter Tercyak (26), the dean of the city’s legislative delegation. The BBQ will be held at 150 Belridge Road and a $20 donation is requested. Meet the candidates and support Voter Registration and Get Out The Vote activities in support of the Democratic slate. Enjoy Rosol’s hot dogs, hamburgers and donated dishes and desserts from DTC members. Governor Malloy chose Pulaski Middle School on August 21st to announce that Alliance Districts in 30 communities are set to receive a total of $132,901,813 in additional funding for the 2014-15 academic year to help implement academic improvement plans. New Britain Schools will receive $11, 079,553 in additional aid further demonstrating the efforts of the city’s Democratic legislative delegation to secure additional support for education. The city is receiving the fourth highest amount among the 30 communities receiving the money targeted to improve student performance. Districts, including New Britain, were required to add K-3 literacy as a focus in their plan amendments. Reading at grade level by the third grade is critically important for future academic success. The enhancement of resources for K-3 literacy and strengthening of early reading supports helps to ensure that Connecticut’s young readers who struggle will get the help they need. The Alliance District aid comes in addition to increases in the Education Cost Sharing funds for New Britain that Malloy made a priority this fiscal year. In a year when residents are absorbing an 11 percent property tax increase the state education aid prevented taxes from going even higher. This entry was posted in Education, Fundraiser, Meeting/Event, Peter Tercyak. Bookmark the permalink.